Hey everyone, you may have seen these in the painting competition this month. My friend has me commission painting some of his warhammer, and this is the first of the DKoK squad he has me doing. There&#39;s still two normal, a Sergeant, and a flamer left to paint for the squad. Those are some damn fine models. What colours are they painted in? Haha, the entire paint scheme? Well, armour is shadow grey, then increasing highlights of shadow mixed with space wolves, then space wolves and skull white. Metal is drybrushed boltgun, inked, drybrushed boltgun, and then drybrushed mythril. Lenses are standard blue lens scheme. Regal, enchanted, ice, dot of white. The cords on the lascannon are straight goblin green and blood red. The backpacks are bestial brown, brown ink, snakebite drybrush, snakebite highlight. Well, i start with an undercoat of either black, codex grey, or fortress grey. The rest of it has splinter camo of the colours that weren&#39;t used for undercoat, plus a bit of white. It is then weathered all over, brown on the bottoms, etc. to make &#39;em look dirty. The entire thing is then given a watered-down black ink wash, and the bases are painted. There&#39;s probably a few highlighting steps i forgot in there, but hey, when I paint I usually just go along with whatever makes it look good, I don&#39;t really have any straight way to paint anything. Yes, those would be yours. 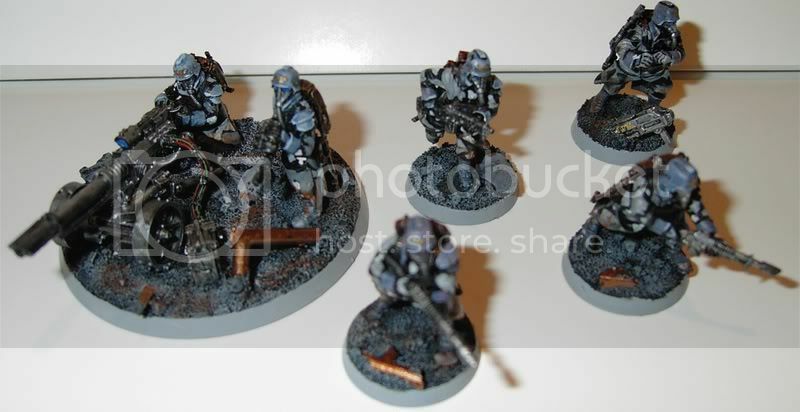 Great paint job for some of the best models around. Those miniatures are looking great! Dirty and gritty. Very much like how we all envisioned the Death Korps of Kreig to be like.